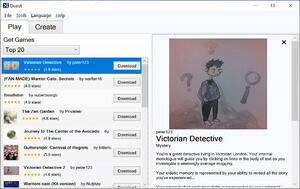 Quest lets you create sophisticated text-based games, without having to program. Make text adventures, role-playing games, training materials, simulations, interactive fiction, online multiplayer environments and more. No programming is required, and a full tutorial is included. Your games can come alive with pictures, sound effects and music. For security reasons, you should also check out the Quest download at LO4D.com which includes virus and malware tests. Additional screenshots of this application download may be available, too. Quest download been highly rated by our users.